The most difficult thing in doing this swap is probably finding all the parts needed. Most stuff is being reproduced, but some things still aren't. Converting can also be tricky depending on what year GTO you have. Pilot bushing: Most if not all 60's and 70's Pontiac cranks are machined to accept a pilot bushing, unlike some other makes of cars. Z bar: 64-66 cars share the same Z bar, clutch rod components, and pedal assembly. 1967 uses unique one year only Z bar, rod components and pedal assembly. Pedals: When putting in clutch and brake pedals, you don't need the pedal housing; the clutch and brake pedals will bolt right in where the automatic brake pedal was. Driveshaft 64-66: 2 speed automatic and manual trans 2 dr cars (also 1967 2 speed auto 2dr Lemans and Tempest) use the same driveshaft which measures 60" from U joint center to U joint center. 1967 GTO's with the TH400 automatic (otherwise known as the M40) used a slightly shorter driveshaft, at 59.34" from U joint center to U joint center. Crossmember location 64-66: GTOs Lemans Tempests crossmember location is the same for 2 speed automatic cars and manual trans cars. Crossmember location: 67 Hardtop: Frames have two sets of holes for the crossmember. The TH400 auto crossmember sits back about 6 inches from the manual trans crossmember location. For hardtop cars, just move the crossmember forward to the front set of holes. Crossmember location 67 GTO convertible: It's not that easy for convertibles or for hardtops with the heavy duty frame option: The factory welded tabs to the inside of the frame rails to mount a special narrow crossmember. You'll have to weld new tabs 6 inches forward. Crossmember location 68-72: cars also have two sets of holes, and the convertibles don't use tabs, so no welding is necessary for either frame type. Z bar tab 64-67 cars: These cars will need a tab welded to the frame to mount the outboard ball stud for the Z-bar. Note the exploded view below to see the tab. Z bar tab 68-72 cars: These years have a bolt on tab. Transmission. I got a muncie but if you're on a tight budget, consider a 3 speed manual. They're super cheap and later you can upgrade as your budget allows. Get a yoke with it if you can. Driveshaft, needed only for 67 and later. Flywheel. There is a large I.D. model and a small I.D. model. I'll post as soon as I find out what is what. Z bar and rods that go from pedal to z bar and z bar to clutch fork. The TH400 automatic equipped 1967 convertible GTO is probably the most difficult combo to convert because it's the one application with the crossmember pushed back. Automatic Tempests and Lemans used the 2 speed trans which used the same crossmember location as manual shift cars. As mentioned before, regular, non-boxed frames have two sets of holes; a rear set for a TH400 automatic, and a forward set for a manual trans/2 speed auto trans. 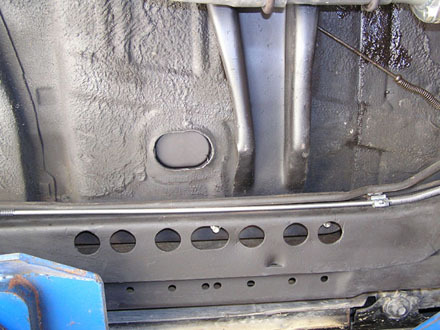 The heavy duty frames (boxed type for convertibles) can't use these sets of holes so Pontiac welded tabs to support a special narrow crossmember. The tab only had one set of holes so if you want to swap to a manual, it is necessary to weld new tabs in front of the original tabs. In the first picture you can see the 8 holes on the left are for the hard top style frame. You can also see where the inside frame rail (heavy duty or convertible option) is welded on and the location of the tab. 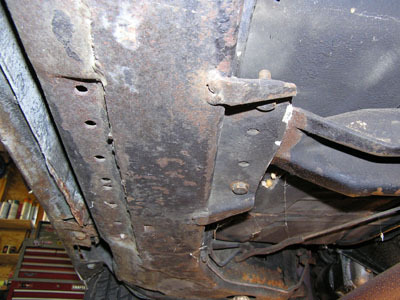 1968 and later GTO's (picture below) have two sets of holes also, but they drilled access holes in the bottom of the frame (see picture below) and mounted the crossmember on top. So no welding is necessary for new tabs. Of course, hardtop owners with regular frames need not worry about any of this, they only need to move the crossmember up and bolt it down. 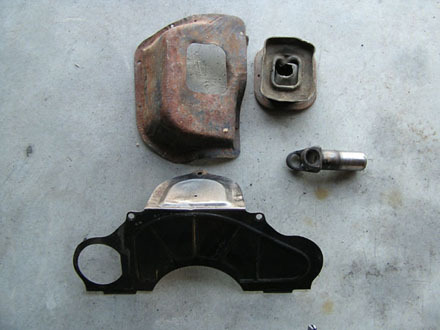 This page will be updated to highlight the swap I performed on my 67 GTO. For now, some tidbits about the conversion are parked here on this page. Bear with me until I can clean it all up and present a nice "story" about how the conversion worked out. Thanks. I bought a set of used MT pedals a few years ago, and I just noticed recently that the clutch pedal was previously repaired: A crack was welded on the bar that the pushrod inserts into. The weld repair was good, but I still wanted to beef up the bar. I turned the juice up high on my Lincoln MIG and added an 1/8" "gusset". Click to see the gusset. I found a set of chevelle 4 speed reinforcement bars for the frame at a local swap meet for 15 bucks. 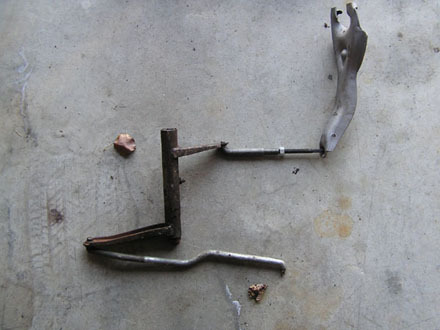 (These bars were used on manual transmission A-body cars and tied the lower control arm brackets to the rear crossmember on the frame.) They were cheap 'cuz one of them was cracked by the mounting hole. To fix it, I just sliced the cracks with a cut-off wheel and welded the slices up. I'll fill the minor pits, paint 'em and bolt 'em on. I need a 4 speed version of the firewall steering column clamp, but prices for used ones are crazy. So I purchased an auto trans style plate for 5 bucks and cut the hole for the clutch rod myself. I didn't want to cut my original in case I switch back to the TH400 some day. Note the original automatic trans version clamp on the left, and the modified/converted automatic trans style clamp on right. I used a hole saw, cut two overlapping holes and used a beefy file to make the final shape. Jeep Forward Control "Mighty FC"
Here's a really cool something Jeep engineers and marketing people came up with that they will never build. I'd buy a Jeep pickup if they would just make one. Oh well. Above is a link to an FC concept hype-mobile. These two videos feature an original owner GTO. This car was featured in Hemmings Muscle Cars magazine a couple years ago. Part 2 has inside and outside shots of the owner driving the car. Very nicely done. "Mississippi" Fred McDowell. One of the great Bluesman. This is a documentary made in 1969. Pinstriping the ol' fashioned way. Pretty nice. Blues Traveler plays often on the Dave Letterman show. Here they are playing a toe tapper with Paul Schaffer. Pepsi has put out a "limited edition Throwback" version of Pepsi with REAL sugar, instead of high fructose corn syrup which has been used since the 80's. Holy cow there IS a difference; it's WAY better. Find some quick!